The young Don Corleone arrives in New York, getting an entry level position in the Mafia. 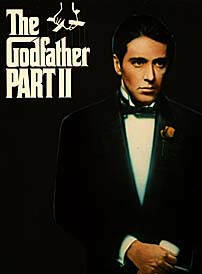 Director Francis Coppola's "The Godfather Part 2" is the rare sequel: it's better than, the original. The cast includes: Al Pacino, Robert Duvall, Diane Keaton, Robert De Niro, John Cazale, Talia Shire, Lee Strasberg, Harry Dean Stanton, Danny Aiello, Roger Corman, and James Caan.